Looking for the perfect baby shower that any expecting mother would love to receive? Well I have the perfect kit to make for your next baby shower, a Baby Bath time Kit! Having 2 kids myself, and receiving lots of unnecessary shower gifts, this Baby Bath time Kit is full of items any expecting mother will actually need. For starters it includes these adorable Johnson & Johnson baby products with an exclusive design packaging that’s only available at Target! The design is perfect for all sorts of gift baskets and I highly recommend Johnson & Johnson bath products. I have incredibly sensitive skin and I didn’t want to chance anything with my daughters, so I only use Johnson & Johnson bath products. Safety is their #1 Priority, you can read all about it HERE; but, their products are all Hypoallergenic. Want to shop these Johnson & Johnson bath products? Hover over the photo above to click through to Target.com and buy it! For my Baby Bath time Kit I added only essentials. When I had my 1st daughter I registered for what seemed like everything but then received items that weren’t even on the registry. More so, I received about 70% clothes and shoes and about 30% practical items. At the time I thought nothing of it, that was until I actually had my daughter. Now after having 2 girls I only buy essentials for baby showers. Basket, bucket, bag, or even baby bathtub to store everything in. Johnson & Johnson bath products. These are a must! I added Johnson’s Head-to-Toe Wash, Johnson’s Baby Lotion, Johnson’s Baby Shampoo, and Johnson’s Baby Bubble Bath. Bath Shampoo & Soap Rinser. Rubber Ducky, this particular one tells if the water is too hot on the bottom. Throw everything together and you have the perfect bath time kit. 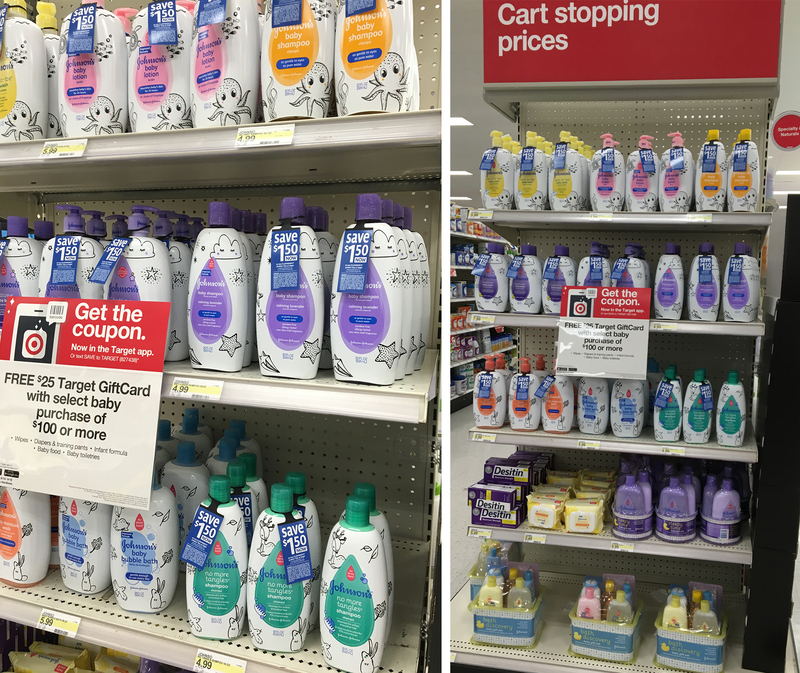 You can find these specialty design packaged Johnson & Johnson bath products at Target located on the end cap in the baby aisle. Remember these are exclusive to Target so if you want these cute designed bottles to complete your gift basket, you’ll have to shop at Target. Know of anyone having a baby this year? What’s your favorite practical gift to give? « How to Create the Perfect Puppy Kit! 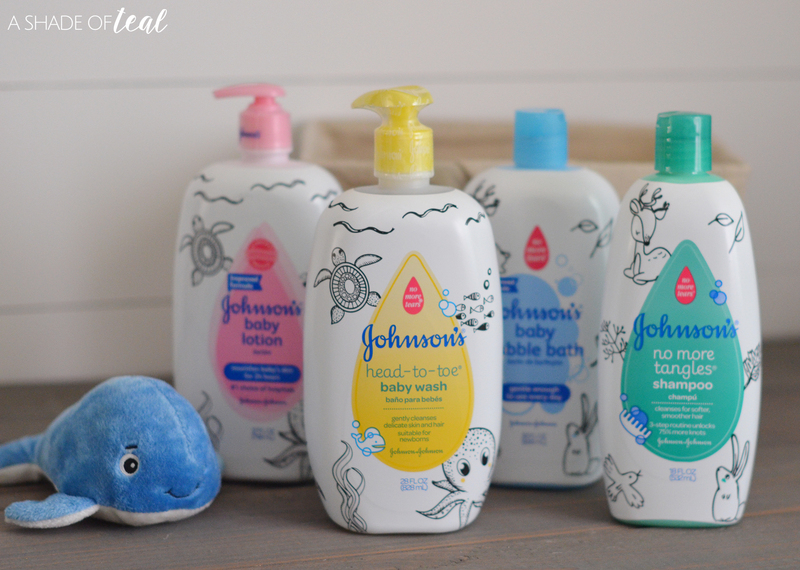 I don’t know what it is about the Johnson & Johnson’s baby line, but the smell just melts my heart! Love this little bath time kit – it’s such a convenient and sweet gift to give to friends and family! By the way – I think the temperature-smart rubber ducky is a cutie (and very practical). Such cute bottles. I love the idea of a bath basket for a gift. I love giving gifts like this that aren’t easily outgrown. Also love receiving them. I’m loving these cute packaging. We use Baby Johnson products when our kids were little. I like your picks for baby shower gift. So neat! I love giving gifts like these. Easy and very much needed by any mom! 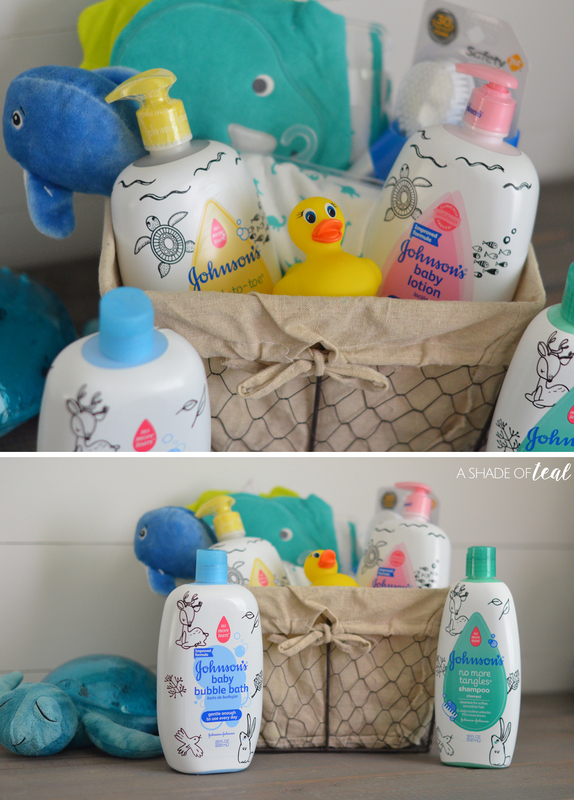 Oh i love giving baby bath time kits for babyshowers. Although I usually just get this prepackaged but I should totally DIY it. I have a new neice and nephew that I would love to make these for. How cute!! I love the new bottle designs. This is perfect and so cute! I’d love to make one for the next shower I attend. The baby bath kit is a great idea as a gift to a new mom or a pro mom.